Special Collections Welcomes New Archivists! Earlier this month Special Collections welcomed two new archivists: Mary Manning and Vince Lee. Mary Manning is the new University Archivist. She previously served at Texas A&M as Assistant Archivist and the Digital Collections Coordinator for A&M’s Digital Services Center. Once she has had time to get moving full steam ahead, she will also be handling our Hispanic collections and the Jagdish Mehra Collection. Archivist Vince Lee is overseeing all the collections in the Carey C. Shuart Women’s Archive & Research Collection. He will also be handling the architecture collections and the Texas and Houston historic collections. 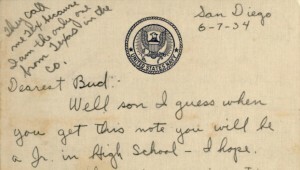 A letter from Slough to his younger brother, dated June 7, 1934. Click to see the full letter. Special Collections is happy to announce the publication of our latest collection in the UH Digital Library, the William Slough USS Houston Letters. This collection of letters from William (Bill) Slough to his family while he was aboard the USS Houston (CA-30) vividly documents what life was like for sailors prior to World War II. The letters were sent from 1934-1936, starting just after he enlisted in the Navy on May 15, 1934. In the letters, Slough discusses myriad aspects of the military life. He worries about family and money, how to spend his leave, and how to gain much desired promotions and pay raises. He also writes about learning to love travel and deciding to pursue a career in the military. Most of the letters originate from Long Beach, California, the Houston‘s home base at the time, but Slough also discusses the ship’s travels, including time spent at Guantanamo Bay, Cuba. The digital collection also includes a photograph of Slough in his dress blues and copies of his Crossing the Line certificate and subpoena. 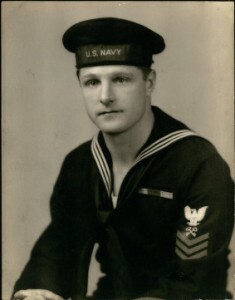 William Slough was born on May 19, 1914, in Missouri but later moved to Texas, where he lived before joining the Navy. In addition to serving on the Houston, a heavy cruiser, he also served on the USS Cowpens (CVL-25), an aircraft carrier. He served in World War II, and after the war he continued in the Navy Reserves for 20 years. Slough was proud to say that with his service, every generation of his family had served in the United States military, beginning with Matthias Slough in the Revolutionary War. William Slough died on Dec. 9, 1991, in Victoria, Texas. A letter from Slough to his mother, dated Feb. 24, 1935. Click to see the full letter. The William Slough USS Houston Letters are part of the larger Cruiser Houston Collection. Another digital collection related to the Houston is the USS Houston Blue Bonnet Newsletters. Are you on Facebook? 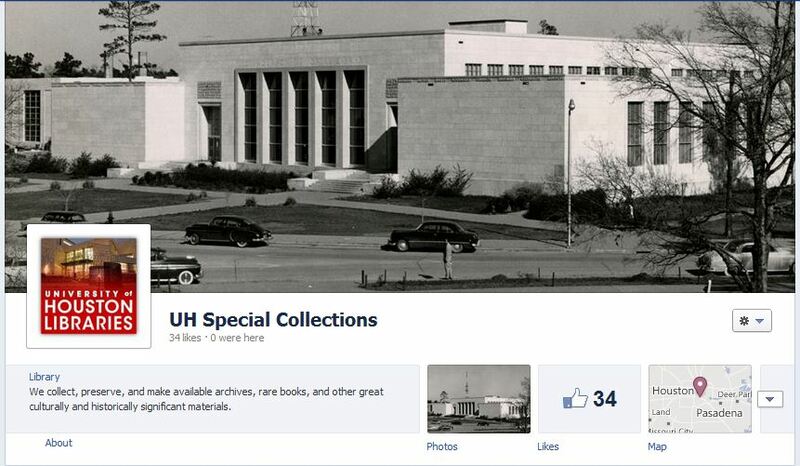 If you are, have you liked UH Special Collections yet? We’ll post Reading Room and university closures, announcements, and other information directly to the Facebook page. Some of these items don’t make it into the blog, so don’t miss out! And while you’re at it, check out the UH Libraries page and the UH Digital Services page.